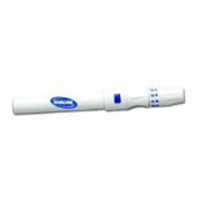 Safety lancets are single-use lancets with a retracting needle or sheath covering. The use of safety lancets prevents needle stick injuries, sharps injuries, cross-contamination, and other such related accidents for patients and healthcare professionals. Safety lancets are used in hospitals, nursing homes, homecare, and other healthcare settings. The use of safety lancets for blood sampling has become critical in recent years. The Occupational Safety and Health Administration (OSHA) established a new directive requiring healthcare providers to select safety devices based on appropriateness of procedure, effectiveness, cost, and availability. This has spurred research to develop new devices, such as low-cost safety lancets. The documented high incidence of needle stick and sharps related injuries has created a need for safety devices such as safety lancets. Research shows that for every 100,000 conventional needles used, 1 to 40 needle stick injuries occur. Approximately 2.7 percent of these needle stick injuries each year result in HIV exposure. Though OSHA has published reports on Occupational Exposure to Bloodborne Pathogens related to needle stick injuries, such injuries still occur, infecting approximately 600,000 workers each year with the hepatitis B virus, hepatitis C virus, and the human immunodeficiency virus. The Center for Disease Control and Prevention estimated that the developments in safer practices and safer equipment could prevent 62-88 percent of needle sticks and sharps related accidents in the healthcare environment. Safety lancets are simple to use. No arming is required. The lancets are safely concealed before and after use and are easily disposed of. Once they are used, they are rendered inoperative, providing added safety for both patient and healthcare provider. Safety lancets provide quick delivery and penetration, minimizing pain and error. They are available with either a needle or blade, each with different depths of penetration, to provide optimal blood flow for different applications and skin types.